Research and Development has a relatively long tradition in PETROF. The research centre was established in the beginning of the 60′s and until 1989 it engaged in music acoustics of wind and string instruments; today it is only used for pianos. Another sphere of interest is concerned with vibrations, signal analysis, measurement of characteristics of wood and metal, development of special measuring methods etc.. At present, the company has a modern and one of the biggest free-field rooms in the Czech Republic, which started operation at the beginning of 1995. Further, extensive measuring equipment for reading of sound and vibration is available here, including means for analysis of signal and experimental modal analysis. Attention is also paid to the influence of the climate on material features of resonance wood. Recently, the research activity has been focused on cooperation with universities, research centres in Czech Republic and abroad. The results gained from academic research are then applied and used in practice. The research is concentrated on the question of creatingnumerical models of individual parts of the piano having influence on its acoustic features. For that purpose, measuring methods are developed in order to allow for the obtaining input data for numerical models and to allow for assessing the validity of such models. At the same time, the developed measuring methods serve directly to objective assessment of the quality of our production. Empirical knowledge obtained from collaboration with manufacturers and musicians have been significantly completed with music acoustics and technical physics recently. The development of these branches actively solves the related improvement of the sound of the instruments. 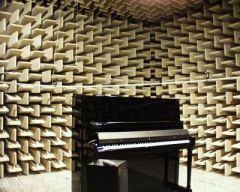 Research on the impact of changes in material and technologies used is possible and imperative, both from the point of view of long-term stability, and from the point of view of acoustic qualities of all instruments. The creative work is based on systematic activity extending the accuracy of understanding, which leads to the use of the obtained knowledge and creation of hypotheses in new or considerably improved technologies introduced into the practical production of musical instruments. Petrof always strives to satisfy their clients by ensuring their manufactured goods to be of the highest quality through systematic research & development, innovation and improvement. The PETROF brand is based on tradition – tradition of our instruments made by qualified people with years of experience. 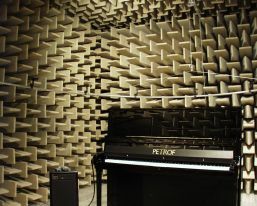 The Petrof company uses its big volume free-field measuring room for acoustic measurements in order to achieve the best possible sound quality of its own instruments and their balance whilst simultaneously preserving the typical colour of the PETROF sound character. PETROF also allows other companies to use the big volume free-field measuring room under very favourable conditions. These companies need to test the technical parameters of their products so that they comply with the demands of the market and of the European ISO 3745-77 standards and the big volume free-field measuring room allows for this. An integral part of the research centre consists of the climatic-technological Feutron chambers. They are intended for the verification, testing and evaluation of research, but also for the use in industry for quality control, climatic-technological tests (e.g. of glues – glued joints, resistance of paints), research on the influence of temperature and humidity on building materials, industrial products, influences on biological processes, creation of stress temperature conditions, acceleration of periods of material aging etc.